Panicum depauperatum (Dichanthelium d.).Robert W. Freckmann.Robert W. Freckmann Herbarium. University of Wisconsin at Stevens Point. wisplants.uwsp.edu (Accessed 5/2014). 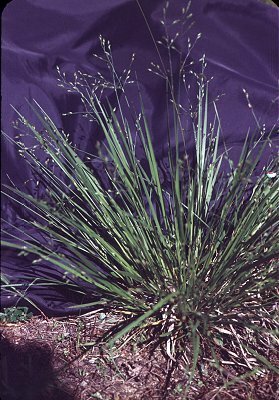 Dichanthelium depauperatum is a perennial C3 grass ((Waller and Lewis 1979), 10-40 cm tall, densely tufted stems very slender, sheaths often finely hairy. Leaves crowded near base, basal and stem leaves similar, linear, 8-20 cm long, 0.2-0.5 cm wide. Flower spikelets 1-flowered, 0.3-0.4 cm, spikelet stalks crooked, 3-8 cm long, few branches; blooms May-Aug.; primary inflorescence narrow, sparsely flowered, not much longer than leaves; late season inflorescences very small, often concealed by leaves near base of plant with one or a few spikelets; blooms July-Oct.